Background: It is very likely that RNA secondary structures, more so than the sequence itself, are closely related to their functions, especially for mRNAs and even short noncoding RNAs. However, secondary structure of most lncRNAs (long noncoding RNAs) remains poorly understood. Method: Here, we perform a large-scale investigation of lncRNA secondary structures especially for hairpin structural motif in human and mouse based on computational prediction using the RNAfold software. Results: The main results show some difference between lncRNAs and mRNAs in various kinds of local secondary structures. However, there are many hairpins in lncRNAs, even in those with short sequence length, suggesting lncRNA as a highly structured RNA molecule. Furthermore, in both human and mouse genome, there are more lncRNAs than mRNAs containing long-stem and big-loop hairpins. It is important to note that these hairpins in lncRNAs are inclined to compact together and form a junction-like structure motif which we call hairpin junction. Tetraloops are also analyzed to uncover the probable associations with lncRNA functional stability. Conclusion: Taken together, we find the secondary structure of lncRNAs has many characteristics, most of which are similar with those in mRNAs. 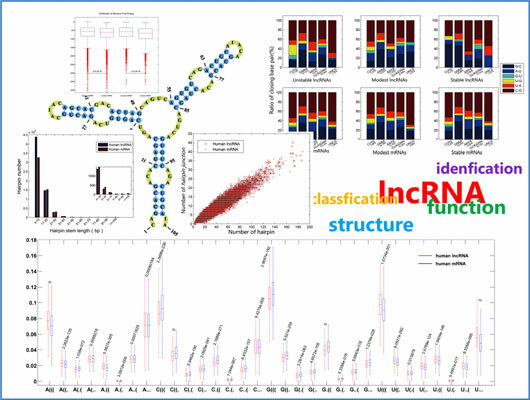 And we provide evidence of various lncRNA secondary structural components, which can be exploited in lncRNA identification, the classification of different types and the inference of function annotation. Long noncoding RNA, secondary structure, prediction, hairpin, tetraloop, junction.